Best Spinning Rods 2019 | Which One To Choose? Of course, what’s a fisherman without his rod? If you are in need of a new spinning rod, you do not want to waste your pick on the first one that you see. There are many things about rods that you want to look for as well as to avoid. But thankfully, you do not need to aimlessly browse sporting goods stores or websites any longer. We have eight of the best spinning rods, and we will review them all to find out which is the one that you should most likely buy. A good spinning rod should be strong, flexible, and should be able to cast lines effectively. They should also be very comfortable to hold, and should not slip out of your hands for being too wet. It is also important to know that a few of these rods come with their own reels. If you are looking for a rod, do not forget to buy a spinning reel, if you do not have one already. Without further ado, here are our eight rods that we will take a closer look at for your consideration. What Else Do You Need To Know About Best Spinning Rods? Shakespeare’s Ugly Stik series never ceases to amaze fishing purists. 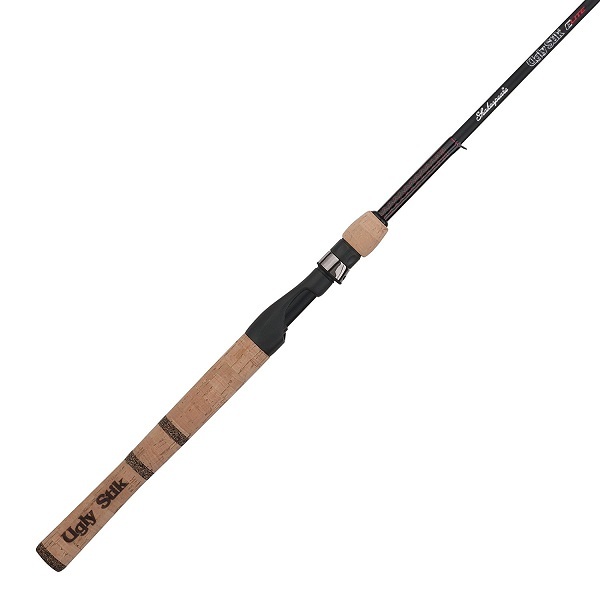 This may be called an “Ugly Stik”, but there is nothing ugly about its features. This rod is available in one piece or two pieces. The sizes range from 4-feet-6 to 9-feet. This rod feels lightweight and strong. So not only can you carry it well, but it feels professional in your hands. If you are looking to fish with this rod for a long time, you will enjoy the EVA grip that it comes with. The majority of this rod is made up of fiberglass and graphite, which are not the strongest materials, but still look great and last a long time. The Ugly Stik does not need stronger materials, because this is a durable spinning rod as is. If anything, stronger materials will only raise the price. You are able to feel tugs from the smallest fish thanks to the lightweight design of this rod. This is due to the clear tip design that comes with the Ugly Stik GX2. The downside to this rod, as far as two pieces go, is that they can disconnect at a moment’s notice. A one-piece rod is the better investment, with that said. The KastKing Perigee II is a fairly new rod that is more designed for veterans of the sport. This is a professionally crafted rod with a modern design. These rods come in both one and two pieces. There is a craze in fishing today in which the majority of rods are made of carbon fiber, which many fishermen look for when they want performance, endurance and power. This fishing rod is not just built to be strong, but also flexible, thanks to its carbon matrix KastFlex technology. The power transition system allows lines to be cast very smoothly. Flick the rod forward and always expect the line to be thrown in front of you perfectly. If you buy the two-piece rod, it is like buying two rods for the price of one. You can choose to change your rod tip so that you can change the type of rod you have, from medium to either medium heavy or medium light, depending on the size that you buy. Believe it or not, but the manufacturers offer customers with a lifetime warranty. If you use the rod and it breaks outside of your control, you will get a free replacement no matter how long ago you bought it! The one thing to be wary of is that the size selection is not that impressive. If you are looking for a super short or super long rod, you may not be impressed with what is offered here. Sougayilang’s spinning rod is a nice looking carbon fiber rod that comes with its own reel. If you have your own reel, and still want to use it, you are not able to fasten it onto this rod, unless you had some way to modify it. You can fish with this combo rod in either a freshwater or saltwater setting. This rod, however, only comes in one piece. The rod has retractable tips, so that you can extend it out to lengthen it in order to fish, and collapse it down to size for storage. There is no bending or taking it apart required, which is what many fishermen prefer. The reel included comes with 13 + 1 ball bearings that are resistant to corrosion. This allows the line to be cast smoothly and will not snag unnecessarily. The reel can be adjusted for both right and left-handed fishermen. The reel also has an aluminum handle. Don’t expect this rod to last if you are going after big fish, however. A good rod needs to handle intense pressure from larger and/or more aggressive fish, and this is not that rod. The rod itself can snap, an eyelet can break, or anything can come off without warning. Sougayilang is a company I respect for trying, but a few of their products could use a little work, including this rod. Another Ugly Stik design, these rods are touted to be indestructible. The Elite promises to provide fishermen with the utmost of comfort and reliability in order to make the fishing experience for the user to be simple and easy. This rod comes in either one piece or two. When holding the rod, it will certainly not tire you out in any way. The cork handle does not make this rod look new or exciting by any means, but it sure does feel so great in our hands. You can hold it for every long time and even use it with a stand if you’d like. This is a rod that cannot flex or bend. It essentially a petrified rod that is meant to give fish on the other end of the line the utmost resistance so that they have no power to work in their favor. If you want a rod that can store easily, this is not the one to buy, unless you get a two-piece version. With the capabilities that it has involving power and durability, this is best used for big and medium-sized fish. The clear tip technology, like the other Ugly Stik rod, can make it so you can feel the faintest of resistance in your hands. It gives you enough sensation to which you can feel the fish without feeling the rod bending or breaking. Also, like the Ugly Stik GX2, this rod is made of graphite for a lightweight design. This is considered an upgrade for just a handful of dollars more. This spinning rod from Fenwick is known to be used for a multitude of different fish species. You can also buy this rod in sizes from medium heavy to ultralight. These rods are perfect for rookies and veterans alike in the sport of fishing. These rods are comfortable to carry, even more so with their handles made of B2 buried cork. Veterans of fishing will enjoy the rod not feeling any different from what they have grown accustomed to. Fenwick has taken over six decades of rod making and put everything that was great about their past rods into this one. This rod is made of graphite, and comes with stainless steel guides and inserts that will not corrode over time. This makes it certain that eyelets will not break off as you try to catch more aggressive fish. Fair warning, though. These rods are more on the expensive side. Their warranty is not really that appealing either, so if this breaks, you are likely going to be out of luck. The Calamus is a rod that is built with style in addition to function. For younger fishermen looking to have a rod to enjoy using, this is not a bad candidate by any means. This rod is available in both one and two pieces. The Calamus is named after the scientific term for the quill of a feather. These rods are made to be extremely light and easy to hold and carry. These rods are praised for their power to weight ratio and a high degree of sensitivity thanks to its micro polish blanks. This rod has a titanium frame to keep everything secure and stable. This is a pricey rod, but unlike the Fenwick rod, this rod comes with a lifetime warranty. If it breaks, and you were not responsible, you can get a new one free of charge. To reiterate, this is a great-looking rod with a lot of great features. You can catch walleye, smallmouth bass, trout, and panfish with these rods with ease. We have yet to find any flaws with this rod, so buying the Calamus for the prices that it goes for is well worth the money in our book. This rod from Penn is known to be a combo rod, which includes a built-in reel. Penn is known to make some amazing spinning reels, so you are not getting just any old reel along with it. This reel has four stainless steel ball bearings, and an instant bearing that is anti-reverse. The drag pressure on this rod is exceptional, and is also silky smooth. If you already own a reel and are not willing to switch to a new one, I am afraid that there is not the way to take this reel off and put another one on. You will need to buy a rod without a reel. This Penn rod is light in weight and is extremely sensitive to the force of fish on the other end. The body of the rod is made of graphite, and the guide is made of stainless steel. This rod as a whole is made so that nothing fails or breaks for a long, long time. This is a rod, however, that is too big to be used in freshwater. It is more ideal for saltwater, and unless you live or travel by the ocean, this will not serve much use to you. The last rod we will look at is another combination rod. This rod comes with a reel, a carrying case, and tackles and lures. It’s a whole fishing set that first-time anglers can buy. This is also an affordable set, so you get all that you need to fish for one low price. The reel on this rod can be removed, so if you have another reel that you want to use instead, you can easily do so. You will want to change the reel to something better, since it is not the best reel you can have available. The Plusinno rod, like the Sougayilang spinning rod, has a retractable tip that you can extend and collapse like a telescope. There is no need to bend it in order to make it small enough to store, and this is always an innovative feature on spinning rods. With beginner’s fishing rods and kits, you would come to expect this rod to not have much quality behind it, and would only last for about a year. But that is surprisingly not the case with this rod from Plusinno. It has a carbon fiber and fiberglass body that makes it light in weight and strong. You May Like This Article: How to Choose the best fishing pants for the money? If you still have not decided on a proper spinning rod yet, allow us to explain in better detail about what makes a good spinning rod. Both the selection of the rod, as well as the reel should depend on the fish species that you are most interested in catching. In some select locations, where bigger predator fish might call home, you will want to take this into account as well. Spinning rods are best identified for their reels that are fastened in a hanging position underneath them. This kind of position is fastened by placing the reel’s support shaft in between the middle and an adjacent finger to extra security. When fishing for medium to large fish, having that extra grip on your rod is necessary for when you least expect a fish to bite. The two most common handle types are made of cork and EVA. Fishing purists prefer the feel of cork, and EVA foam makes a rod look more appealing. There are great rods that you can buy that have either of these materials. EVA foam is better to reduce strain, and is for anglers that hold their rod for an extended period of time. There are also two-handed rods that exist to allow anglers a better chance at reeling in fish. The newest breakthrough in rods with spinning reels is a shortened grip that lets the user put one or more fingers on the blank of the rod. By putting fingers on this blank, you will better feel the gentlest bites that fish will make underwater. Another type of handle is the ergonomic handle, that gives fishermen the most comfortable position and grip. The reel seat is where you attach a reel to a rod. These seats can wear out over time, especially when you happen to fight much large and aggressive fish. The stress applies a great deal of torque to the reel seat. You need a reel seat that is of great quality, along with a cushioned hood. Power depends on the fight you have with fish, and the rods are usually classified into ultralight, light, medium, and medium-heavy classes. Ultralight is for small fish, while medium heavy rods are stiff rods that are more suitable for fish that put up more of a fight. The bulk of spinning rods today are consisting of graphite or carbon fiber, with fiberglass sometimes included with one or the other. Graphite used to be a material that was brittle and that could easily bruise, but technology has made it so that graphite is stronger and more fortified than ever in the past decade. Graphite and carbon are materials that are sturdy and flexible, so that they hand handle tons of pressure when in use. Both the quality of the sealing capabilities and the percentage of graphite or carbon fiber used is expected to play a role in the entirety of the rod’s bearing. Graphite’s tensile strength can be rated by how it becomes elongated when pressure is applied to it. Rods with fiberglass are more sturdy, but less sensitive, and typically will be heavier than graphite or carbon by itself, regardless of size and length. Rods with fiberglass are often for large fish and heavy applications that do not need casting or sensitivity. Elongation, also known as elasticity, allows the rod that is made to bend and spring back into form, so that the rod returns to its intended shape. The best spinning rod that you can buy today, after the careful review is none other than the KastKing Calamus Spinning Fishing Rod. We just love using this rod, and it is an amazing rod for both beginners and experts. It has a very lightweight, a well-crafted design, and a great deal of durability to make your fishing trips worry-free. While other rods in this review are nice and professional pieces of fishing equipment, this rod ticks all the boxes for what a great fishing rod should be, and does not come with virtually any downsides, such as wear and tear or compatibility in fresh or saltwater. And let’s not forget that lifetime warranty. Pay once for the rod and never buy another. It is rather foolish to not take advantage of such benefit. I love to write for readers with a genuine interest in enjoying the fishing. Hence, I started this blog to provide you guides so that you can have a better and more pleasant fishing experience. Splake Fishing Tips – All you need to know about this trout! 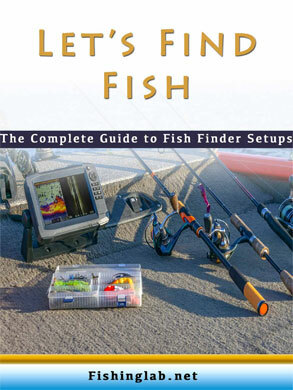 Get This FREE Guide on Fish Finder Setups! Thank you for your continued support! FishingLab Copyright © 2018. Get Organized With This FREE Guide To Fish Finder Setups!